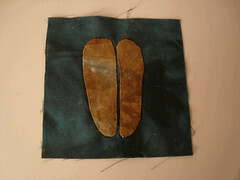 I’ve been working away on the applique feet. I still wish I knew how other people get their curves so nice and smooth, but as Emily said yesterday, it’s a rustic quilt. I like that phrase. Here’s a picture a leopard’s foot. 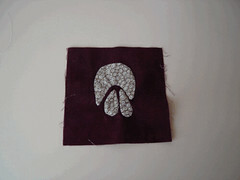 I am particularly pleased with the applique on this one. 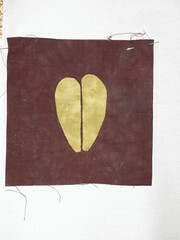 The second block is an otter’s foot, this one also worked out reasonably well. Finally a shot of all of the blocks so far on my ‘design wall’ there will be other blocks that go in between. 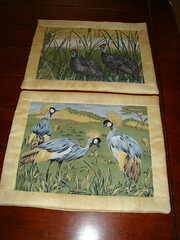 I have 23 more applique blocks to go, but only two or three more feet, then it’s on to the animals. One of the things that I really love about living in South Africa is the abundance of fresh fruit. Currently we are enjoying beautiful old-fashioned watermelon, you know the sort you used to have as a kid with lots of seeds, before they bred all of the seeds and taste out. We live in the Cape Winelands, so we’re also feasting on grapes, then there’s spanspek (rock melon or cantaloupe depending on where you are from), but best of all – trays of farm fresh raspberries. I never ate fresh raspberries in Australia (being in sub-tropical Queensland made them far too expensive). 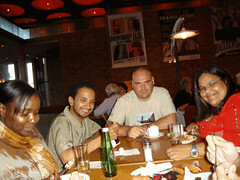 We went into Cape Town and saw a play last night. On Monday nights the theatre has a special deal, patrons get dinner and a show. The cost on Monday nights for the dinner and show is cheaper than the cost of the show alone on other days of the week. We saw Bonhoeffer. Dietrich Bonhoeffer was a German theologian who was involved in an assassination attempt of Hitler. He was executed by the Nazis a week before his prison was liberated by the Allies. It was interesting, but different to what I expected. I was expecting more philosophy than biography. The air-conditioning in the theatre wasn’t working properly either and that made the room very warm. It was a very small intimate performance. The last play I saw there was in a much bigger theatre. Here’s a picture of us just after dinner. 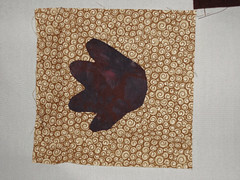 I also have another block done – a leopard’s foot. But showing block by block updates might get a bit boring. I don’t have any appointments or commitments tonight, so I should get a bit more of the quilt done. I’m starting to get quite excited about it. I just wish my applique skills were a little better. Fortunately, the rough look suits this quilt. I don’t usually post stuff like this, but given the background of my blog, I thought this was pretty accurate. You’re an expressive, offbeat blogger who tends to write about anything and everything. You tend to set blogging trends, and you’re the most likely to write your own meme or survey. You are a bit distant though. Your blog is all about you – not what anyone else has to say. What colour should your blog be? Don’t know about setting any blogging trends though. The applique is coming along. I’ve had a bit of a breakthough and I’m getting progressively happier with each piece. Though it is messing with my perfectionist streak just a little. 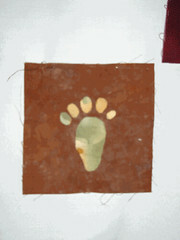 This is the giraffe’s footprint. I love this hand-dyed material. 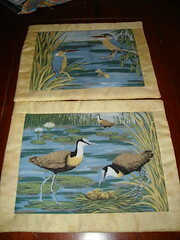 This was traditional freezer paper needleturn applique. To do the zebra’s hoof I sewed vylene (spelling?) to the foot right side down, cut it out with a scant 1/4 inch seam allowance and then cut a small hole in the vylene and turned it inside out. I’m not completely happy with this method and now that I’m getting the hang of the needle turn will probably stick to it, except for the fish block, since I love the fabric, but it really needs stabilising. 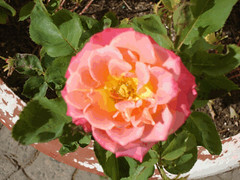 My rose bush has it’s first flower since I brought it home. Finally there’s a new blogger on the block. I’ve been at my friend Kerin to get a blog for ages. She is a cardmaker and scrapbooker extraordinaire and takes awesome pictures, check out her lightning shots. Please pop over and say hello. 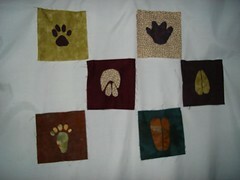 I did another quilt block last night, while watching the final episode of The Apprentice – Street Smarts v Book Smarts. Thursday nights are about to become non-tv nights again. Funnily, I never watched ‘the Don’ while I was in Australia. Here they are hanging on my design wall (really just a piece of fabric I bought and hung over the curtain rail) I bought all of this fabric at the quilting guild, they had a bring and sell your stash day. The lady selling these is a great applique-er and so I got quite large pieces that she didn’t want any more. This is the hippopotamus foot and the antelope foot. I don’t know why that one has gone in sideways. If you look closely you can see that I am still struggling with the needle turn applique on the points, but I think I’ve worked out what I did wrong. So we’ll see how the next one – giraffe’s feet – goes. Then I have to add animals – they are quite abstract representations and are square. I’m going to try my friend E’s technique there. If it works, I’ll tell you all about it. Simone and I have agreed to meet at least twice a week to exercise. Realistically neither of us is going to do it on our own. Yesterday was the first day. Since it was 38 degrees Celcius (approx. 91F) we decided to forego the walk we had planned and swim in the campus pool instead. This was the first planned exercise I’ve done since I moved to South Africa. My arms are a bit sore today after the laps, but I feel good, and we are meeting again on Monday. We won’t talk about the fact that I was puffed and sweating, while in the water, from the effort. With temperatures so high, knitting has become uncomfortable and so my current WIP will remain with one sleeve unfinished until the weather cools down. I don’t mind. I’m in a quilting phase at the moment anyway. Today is Australia, or as they say in some circles, Invasion Day. At home, it is a public holiday. Here, it doesn’t get a mention. Days like today remind me that I am far from home. The heat here is continuing unabated. Yesterday Cape Town was 35 degrees C (about 85F). After work we went to the big mall nearby to watch a movie. We haven’t been to this cinema before as it is twice the price of the one we usually go to, but it was close and the air-conditioning was very attractive. We were a little surprised to be given a seat number when we bought our ticket. I’ve never been told where to sit in a cinema before. We saw Bl**d Diamond. At first I was a little put off by Leonardo’s accent. He gets better as the film goes on, but he really sounds more Australian than South African – except he does say some of the South African phrases very accurately. Parts of it were filmed in Cape Town, I actually saw the set last year when I was in the city, but I did’t get to see Leonardo – he certainly looks the part in the film, even if he doesn’t get the accent quite right. The scene with the general on the farm was filmed quite close to where we live. It was kind of surreal seeing places we know on the big screen, but I guess that is usual for people living in New York and Washington. The movie was amazing a story of love, betrayal and the redemptive power of a parents love. It was very moving, take tissues, I both laughed and cried. Go and see it. It will change the way you look at those pretty stones in your jewellery box. There is one chain of stores here that has signs on it’s windows certifying that it’s diamonds are conflict free, but it is up to us as consumers to insist. 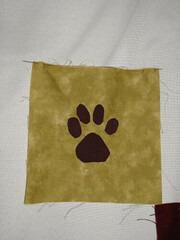 I had a second go at needle turn applique and had much greater success this time. 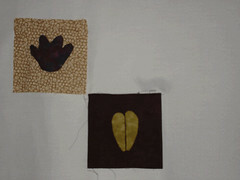 I’ve got the first block of the Geometric African Animals quilt finished – a hippopotamus foot appliqued to the block. I did have a picture, but I’m using a new photo managment program and somehow managed to lose it. I’ll take another photo and post it tomorrow. After getting some advice from a friend who makes beautiful African applique quilts, I’ve also decided to try a different applique method for the blocks with sharper angles. She swears it is quick and easy so I’ll keep you posted. I finally got around to counting up all of the books I read last year. Final tally? 128. Not as many as I expected, but work got a little crazy in the middle of the year. I’m going to try for more balance this year. One of my few New Year’s Resolutions. There’ll be a picture of the quilt block tomorrow, I promise. I will be binding the next lot though, no more ‘enveloping’ for me. Now that these are finished, I have the urge to pick up the needle turn applique again. I’m struggling with the technique a bit, but won’t get any better if I just ignore it, so it’s time to take the bull by the horns, or the thread by the needle and make another attempt. It’s still too hot for knitting, but that is a good thing because it means I’ve got my quilting mojo back. 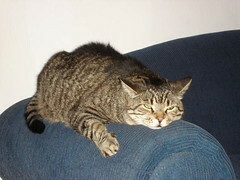 It gets very windy here, and Fat Boy hates it when the wind howls around the house. He whinges and complains. It would seem that he hasn’t figured out that he is not going to get blown away. Lately he has been positioning himself on the arm of the couch and hanging on for dear life. He doesn’t like having his picture taken. He ususally runs from the camera, or stops whatever cute thing he was doing, but here he’s just too concerned about hanging on.